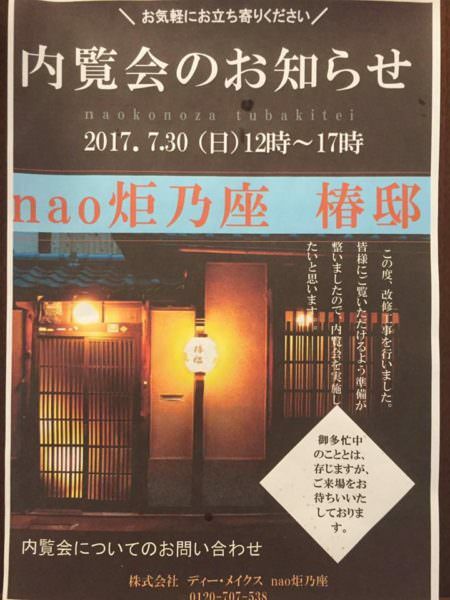 京の宿日記 > 7月30日、京町家 小宿 nao炬乃座 椿邸 京都駅の内覧会を開きました。On July 30th we opened Tsubaki Tei to present it. 7月30日、京町家 小宿 nao炬乃座 椿邸 京都駅の内覧会を開きました。On July 30th we opened Tsubaki Tei to present it. Yesterday, we held a presentation of Tsubaki Tei for the people in the neighborhood ! In August if there is time you could also come to see. Hier, nous avons ouvert Tsubaki Tei au public pour les gens du quartier afin de leur presenter ! Au Aout aussi si il y a un peu de temps vous pouvez venir voir si vous le souhaitez.